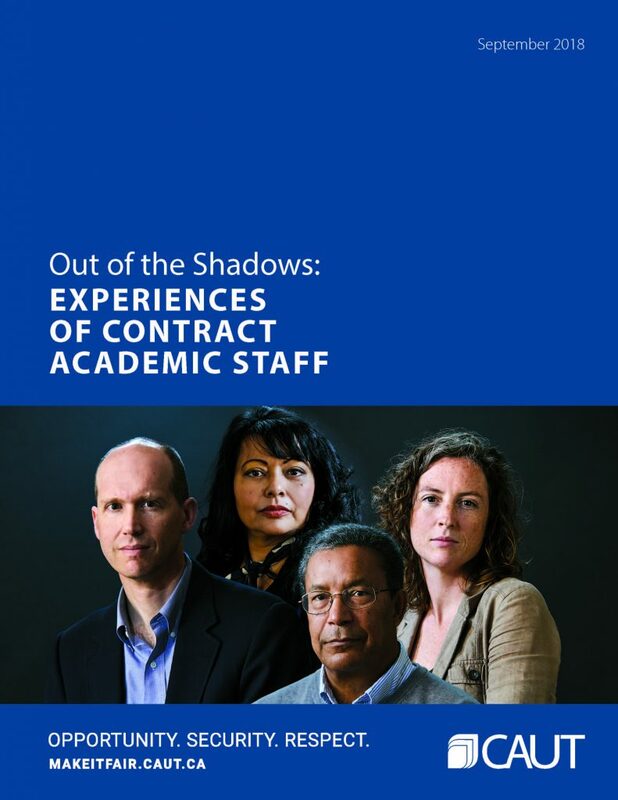 Cover of CAUT “Out of the Shadows” report. On the day after Labour Day, the Canadian Association of University Teachers (CAUT) released its long-awaited report from its first national survey of over 2,600 contract faculty who had taught at least one course in the 2016-2017 school year. The numbers, while unsurprising to many contract faculty, were quite shocking. And yet the release of the report has made barely a ripple. To date, there has only been one news article published on the report, from the Toronto Star. Given the lack of news coverage, I would like to review some of the more significant findings, since they reveal major structural and systemic problems which impact faculty at all levels. Who Are Our Contract Faculty? In publications as recent as 2018 it has been stated that a significant number of sessional instructors were professionals like doctors, lawyers, and engineers who taught the occasional course. However, CAUT’s findings show that the highest numbers of contract faculty can be found in the humanities (21%) and in the social sciences (18%). And contrary to some findings, CAUT found that over 47% of contract faculty held doctoral or “post-doctoral degrees.” Further, these are not individuals who are simply teaching for a couple of years before securing a tenure-track position. 59% of respondents had worked as sessional instructors for over five years, including 25% who had worked for between six and ten years. The majority of contract faculty are, perhaps unsurprisingly, in their 30s, 40s, and 50s. What Kinds of Work Are They Doing? In general, 70% of contract faculty work on a course by course basis, sometimes across multiple institutions. Depending on the hiring cycles of universities, which can vary significantly, this can mean reapplying for your job between every four months to ten months, and renewal is rarely guaranteed. The number of courses that each contract faculty teaches per year can also vary significantly, although CAUT found that 40% taught more than four courses per academic year. In many cases this is the equivalent to a full course load for regular faculty. However, this does not translate into significant amounts of money. Approximately 49% of sessional instructors make less than $50,000 per year, despite these heavy course loads. A further 27% of contract faculty make between $50,000 and $80,000 per year. In comparison, Statistics Canada reports that the average starting salary for assistant professors across all fields is $103,400. When we consider that many contract faculty are also expected to publish on a regular basis (67% reported working on peer-reviewed articles and 26% on non-peer reviewed publications), and that 75% report having to do some kind of committee work (60% reporting that this work was unpaid), there is a serious discrepancy here, one that cannot be justified by saying that contract faculty only teach. Overall, 68% of respondents asserted that they did not feel secure enough to make major financial commitments, like purchasing a house. 33% reported that their contract work impacted their ability to make long-term plans, such as whether to marry or have children. 48% reported being required to work at least one other job in order to make ends meet. 69% disagreed or strongly disagreed with the statement “their working conditions were fine.” Finally, 53% reported that their contributions to the institution were insufficiently recognized by the academic and institutional community. There are again clear indications that both gender and race are important factors here. There are significant disparities when we compare the statistics on gender for full-time faculty and contract faculty. According to Statistics Canada, in 2016, 40% of total full-time faculty members were women. In comparison, 56% of respondents identified as women in the survey, 35% as men, 7% as LGTBQ2S*, and under 1% as transgender/non-binary/third gender/preferred not to describe category. Unfortunately, there is no corresponding statistical data on the race of full-time professors, though the CAUT survey showed that 73% of the respondents identified as white, while 27% identified as categories other than white, with 2% identifying as Aboriginal. When stress rates were correlated with gender and race, women and Black, Indigenous, and non-Black People of Colour were more likely to find their work extremely stressful, while men and white contract faculty were more likely to not experience stress at all. There was also a discrepancy based on income. Men and white contract faculty were the most likely to be represented in the highest income categories (over $80,000), while women and Black, Indigenous, and non-Black People of Colour were more likely represented in the lower income categories (under $50,000). Women and Black, Indigenous, and non-Black People of Colour were also more likely than men and white contract faculty to work more than fifteen hours per course per week. While the report does not discuss this matter in detail, there are clearly equity issues with respect to contract faculty work. As depressing as this report is, it is important to understand that this is a matter that should concern all academics. The data in this report is evidence of widespread systemic and structural problems that affect universities across the country. While contract faculty bear the brunt of it, regular faculty are not immune. As the Toronto Star piece notes, this situation is due, at least in part, to a significant decline in government funding for post-secondary institutions. In the 1980s, about 80% of post-secondary institutions’ budgets was composed of government funding. These days, that number is under 50%. These cuts have coincided with a dramatic increase in the number of part-time professors, which has increased 79% between 2005 and 2015. In comparison, the number of full-time faculty only increased 14%, and the number of university students grew by 28%. But what neither the report nor the article discusses that, as tenured positions are being cut and individuals who retire are not being replaced, the service and administrative burden is being shouldered by fewer and fewer individuals. Not only are class sizes growing, but the bar for qualifying for teaching assistants is moving higher and higher. All faculty members are under tremendous pressure to maintain course enrolments. What’s more, even tenured professors can and have been laid off. I am positive that this is not the only dismal report you have read on work conditions for contract faculty, nor is it likely to be the last. Many of you may be thinking, “that’s all well and good, Andrea, but there isn’t really anything we can do about it.” But you see, I don’t quite agree on that matter. This past summer, Aimée Morrison wrote an essay on Twitter with a concrete list of what tenured professors in particular can do to fight against manifestations of privilege and inequity in the academy. Think about how your pedagogy and syllabus are designed to perform gatekeeping. Most importantly of all, we need tenured faculty to advocate for us. As I said before, this is not a problem that affects contract faculty alone, and without all of us working together, as one friend put it, this generation may be the last one with tenure. I’m in. Are you? Special thanks to Lee Blanding, Georgia Sitara, Krista McCracken, and Shannon Stettner for their help with this piece. In the interest of full disclosure, the author of this blog post was quoted in the aforementioned news article.